I came across the guidebook for the Snowdonia Way while pottering about in a bookshop. 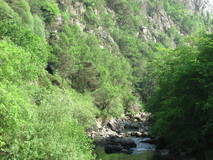 It was a fairly new route, which took in the length of Snowdonia, starting in Machynlleth in the South, and heading North all the way to Conwy. 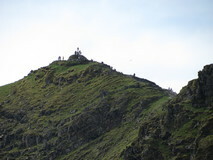 As well as the main route, the guidebook also described a "Mountain Route", which was a bit longer, and took in lots of summits. 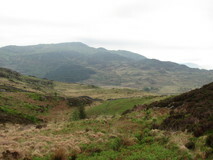 I had not really done any walking in Snowdonia since doing the Cambrian Way in 2008, and the Mountain Route looked like it took in some of the same summits, but also some other interesting bits that I had not done before. Anyway, it was too much to resist, so I bought the book, and arranged a trip for the last week in May. To squeeze the most out of the days off work, I headed off straight from work on Friday, and five hours of train travel got me not quite all the way, but as far as Shrewsbury, for ten o'clock, where I had booked a bed for the night just sixty seconds walk from the station.. 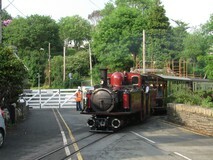 I got a nice early train from Shrewsbury, and arrived at Machynlleth station for quarter to eight. I was really looking forward to a good breakfast, and walked the short distance into the town, but there didn't see to be anything open, so after the obligatory photo of the clock tower, which was the route start, I pushed on. 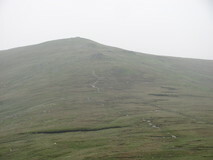 It was a fairly dull day, but dry, although the tops of the hills were covered in light cloud. 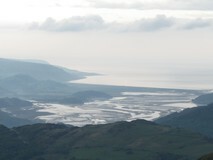 The first bit was quite familiar, and easy to navigate, as it followed a stretch that I had done on the Wales Coast Path, to just outside Pennal. 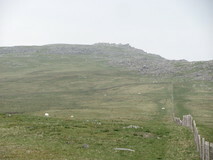 From there, a selection of minor roads and tracks, then a faint grassy path marked out by a row of reeds took me to a grassy shoulder, which then quickly led to the summit of Tarrenhendre. 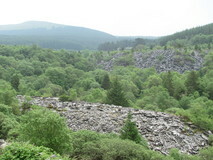 After descending, the route continued through forest and came to old slate mining works at Bryn-Eglwys, where there were huge slate spoil tips on the hillside poking out of the trees, and I passed a quarry with sheer vertical slate walls. 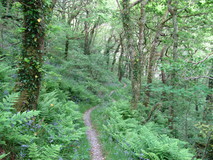 After the old mining works, the route dropped into a forest alongside the small stream of Nant Gwernol. 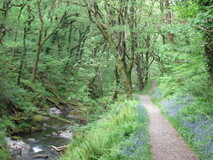 It was a lovely stretch, with a mix of deciduous trees, patches of bluebells, lots of little flowers, and small pools and waterfalls in the stream, before eventually popping out at the small village of Abergynolwyn. There was a cafe in the village, and I got a pot of earl grey tea and baked potato with beans, and got them to refill my water bottles. 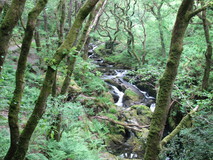 After the village was a nice stretch traversing grassy hillside, with the small stream of the Afon Dysynni below. 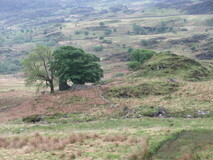 The route passed by Castel y Bere, where the remains of an old castle could be seen poking out of the trees on top of a rocky outcrop. The sun had come out by now, and it had warmed up quite a bit, and I stopped beside a small chapel to put some sun cream on. 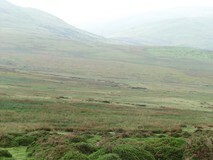 From here a minor road eventually turned into a track which started climbing up towards Cadair Idris. Shortly after passing some sheep pens, just before a stile, was a small stream which looked like it was the last water source for a while, so I refilled all my bottles. 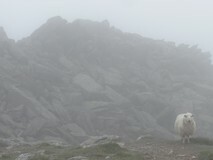 Apart from a group of young guys doing their Duke of Edinburgh award who were cooling themselves off in a stream, I didn't see any other people coming up this route, but once I met up with the Pony Path it got a bit busier, with a few groups still on their way up to the summit. 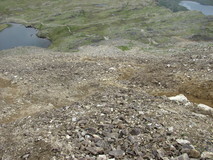 Unlike the nicely sheltered slopes below, there was a strong chilly wind up here. 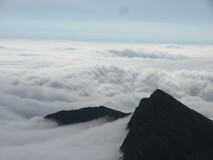 I reached the summit at seven, and adjourned to the small shelter to brew some tea, and cook up some noodles. 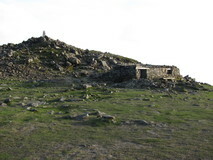 There were still people arriving at the summit quite late, including two young women who arrived at quarter past eight, and took a selfie of themselves in front of the trig point, with their hair blown almost vertical by the wind! After tea, I was in two minds as to whether to sleep in the shelter itself, or try and find a spot out of the wind for the tent. In front of the shelter itself was slightly sheltered from the wind, so I decided to give it a go, and started pitching, but a sudden gust flattened the tent mid-pitch before it was properly guyed out, so I thought better of it, and quickly scuttled back in with all the bits. 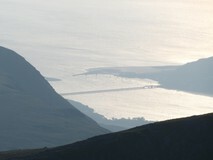 Just before sunset, there were superb views, including a distant Barmouth bridge. 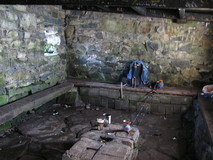 There was a choice in the shelter of sleeping on the floor, or on one of the benches. The floor was quite uneven, but worse there were a few bits of broken glass about, so I didn't fancy risking my inflatable sleeping mat on it, and went for the bench. It turned out OK overnight, although the benches were a bit narrow, so I was a bit limited in my sleeping positions to avoid falling off! The strong wind kept going all night, and there were various creaks and groans from the roof as the wind caught it. A couple of times during the night I woke up and could have sworn I could hear noises that sounded like a radio, but I finally decided that it must just be distant noises carrying on the wind. I got going at half past seven. It was dry but dull, and there was still a strong cold wind, so I needed all my clothes on, including waterproof trousers and top. 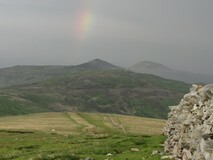 It was fairly easy going to Mynydd Moel, apart from occasional gusts trying to push me off the path. 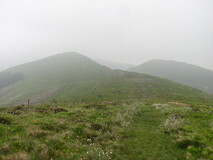 After Mynydd Moel, there was a steep descent, then an easy stretch along a grassy shoulder, before descending the quite steep shoulder of Gau Graig, with a few easy rock scrambling sections. After the descent the route went across boggy ground on a fairly vague path, and I was quite relieved when I crested the top of a small hill and found that I wasn't that far away from the expected stile. 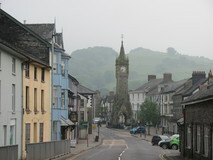 Easy minor roads then led to Dolgellau, where I adjourned to a cafe and got a pot of earl grey tea and a full veggy breakfast. I then found a small supermarket and stocked up on banana bread, dried mango, and some nuts. Leaving Dolgellau, I passed a couple of other hikers who were carrying the Snowdonia Way guidebook, and they turned off to follow the low route. 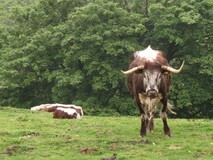 Shortly after it started raining quite heavily, and I had to stop and put full waterproofs on. 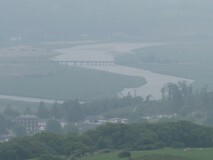 I pushed on up the climb through the forest to reach the New Precipice Walk, which traversed the hillside, with views over the estuary of Afon Mawddach, although the visibility was hampered by the low cloud and rain. 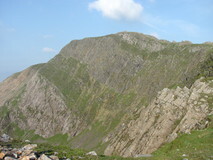 The route gradually climbed up a grassy shoulder to the summit of Y Garn. Navigation was fairly easy, as the route followed a dry stone wall nearly all the way, although you had to switch sides on stiles a few times to avoid getting blocked by stone walls that joined at right angles. 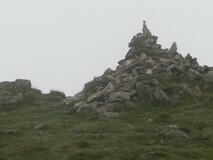 At the summit it stopped raining, and I took a quick compass bearing to check I was descending in the right direction. 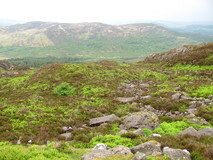 Much of the descent was through knee deep heather with uneven rocks and holes beneath it, and the thought did cross my mind that if you injured yourself on the descent, it would be difficult to extricate yourself, and it might be a long time before anybody else came by! So I took it very slowly and carefully, but it was still quite tiring and sweaty work, and I was relieved when I safely got to the bottom and reached the edge of the forest. I pushed on along the forest wall, and I was slightly worried that I had missed the stile that crossed the wall, but eventually it arrived, and I crossed over into the forest, where there was a boggy path. After leaving the forest the route passed by an old ruined house, crossed a small stream, and then headed through a marshy section with a faint path that disappeared every so often. 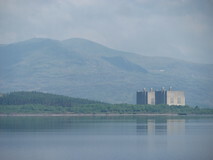 I pushed on in the right direction, and eventually reached a crest, and views of Trawsfynydd power station appeared. After the crest a gently descending farm track appeared, which was easy to follow, and faster going. Half way down the track I had to gently persuade some bulls to get out of the way, but then they followed closely behind me for the next fifteen minutes, which was a little unnerving. 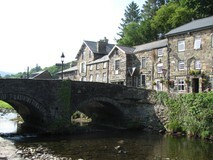 I reached the crossing point of the A470 at half past seven. 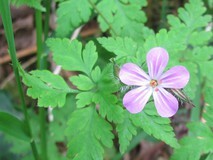 After crossing the road, I pushed on a bit further, and found a secluded spot to pitch up. However, while pitching up I found that the previous night's attempted pitch had actually broken the end of one of the segments of the main tent pole, which I hadn't realised at the time. It was unfortunate as I had passed an outdoor shop in Dolgellau, where I might have been able to get a sleeve to repair it. Thankfully I had a length of duct tape, which I carry wound round a biro for just this sort of thing, and I used it to make a temporary repair by using a tent peg as a splint. Just to add further insult to injury, the area was too thick with midges to leave the tent to do any cooking, so I ended up with just a builder bar and some nuts for tea! When I woke up, the tent roof appeared to be much closer to my face than normal, as my pole repair had sagged a bit during the night. Whilst depitching, I needed full waterproofs on, with hood up, to give some protection against the midges which were still hanging around en-masse. I was on the move again by seven o'clock. It was a nice morning, blue skies and sunshine, and after thirty minutes on the go it was already warm enough to walk in just a T-shirt. 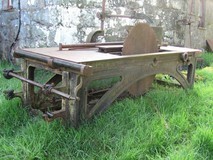 A very quiet road, and a few fields, past a massive old circular saw, led down to Trawsfynydd. I took advantage of the public loo, and also filled up my water bottles. There was a small shop in the centre of the village, which didn't have a huge amount of stuff, so I ended up with some oat biscuits and a few tubes of pringles to keep me going, plus a couple of bottles of sports drink, which I polished off straight away. 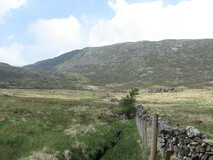 The route soon reached a small col, where it turned off up steep hillside, to reach the long plateau that led to Moel Y Ysgyfarnogod. 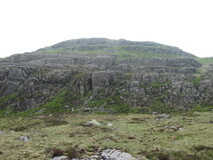 This was an interesting section, slightly tricky as there were various little crags that had to be skirted round, and I was quite impressed that I had managed to do this section previously on a compass bearing in thick mist on the Cambrian Way. 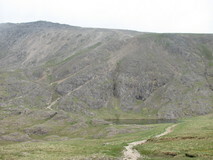 As with last time, the two small pools that were marked on the OS map gave a helpful measure of progress. 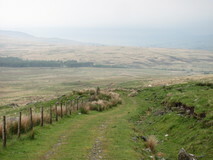 I had not seen a single person since leaving Trawsfynydd, but as I neared Moel Y Ysgyfarnogod I came across a few people. 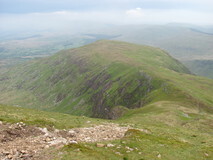 From the summit there were great views back along the shoulder, and ahead to the big rocky lump of Foel Penolau. 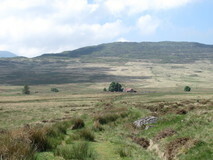 From Moel Y Ysgyfarnogod, the route descended a grassy gully, which very nicely demonstrated the progression of a small stream, starting off as just marshy ground, then it turned into the faintest trickle, then a narrow channel meandering through the grass, and gradually widening into a well-worn rocky stream. 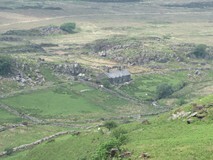 The path then dropped into a pleasant valley alongside the Nant Ddu, with a couple of stone cottages, surrounded by small crags and trees. A minor road then led all the way down to cross the A496, then over the bridge which crossed over the Afon Dwyryd to Penrhyndeudraeth. The bridge is fairly new, and the Wales Coast Path now also crosses it, which is quite a change from when I did it in 2013, when I had to go all the way inland to Maentwrog to cross the river. 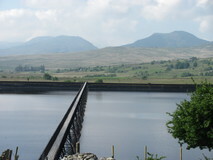 I stopped off at a small supermarket in Penrhyndeudraeth, and got a couple of litres of water to top up all my bottles, plus a couple of bottles of sports drink, which I drank straight away. 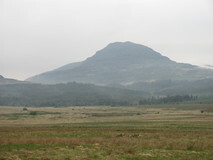 I left Penrhyndeudraeth just before six, and climbed out of town on minor roads. Part way up the road, a chap in a high-visibility jacket was closing some gates across the road to let the steam train go by. On leaving the road, there was a pleasant section across grassy hillside with scattered small trees, and I sat down on a bench in the evening sun, and brewed some tea, followed by noodles. 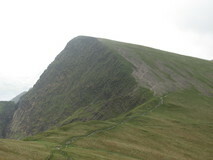 An older chap with binoculars passed by and stopped for a chat, and it turned out had been a very enthusiastic walker, having completed all the 2000 and 3000 feet summits in Wales, in addition to all the munros in Scotland. After tea I pushed on a bit, and found a secluded spot to pitch up. I made an improvement to the tent pole repair, by using a stick I had spotted on the ground as a splint, which I lashed to the pole using some short pieces of spare shoelace. The new improved tent pole repair worked much better than the original repair, and the tent was still its proper shape in the morning. The only drawback was that the pole didn't fold up any more, so I attached it to the outside of my rucksac. 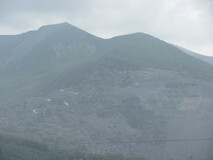 On yesterday's climb out of Penrhyndeudraeth I had noticed that my feet were starting to feel quite sore in places, not actual blisters but just very rubbed in places, and I put three compeeds on before getting going. I was back on the move just after seven. It was already quite warm, and I soon had to take my fleece off. 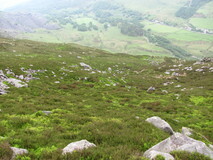 There were a few marshy bits at first on the way up to the col between Moelwyn Bach and Moelwyn Mawr, but it firmed up as it ascended, and I reached the col at half past nine. 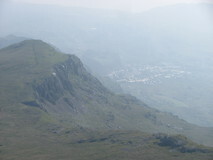 Cracking views appeared over the small lake and dam of Llyn Stwlan, and a very hazy Blaenau Ffestiniog. 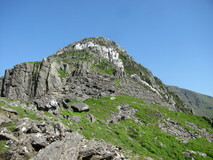 I stopped for a breakfast snack and put some sun cream on, then pushed on up the steep rocky climb to Moelwyn Mawr, past an impressive band of white quartz on the hillside about half way up. 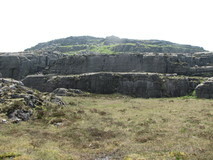 Superb views from the top, across the whole Moelwyn plateau, old abandoned mining works, and the huge shoulder of Cnicht. 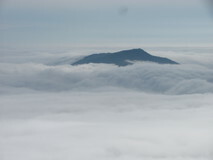 From the summit I dropped down to the plateau. 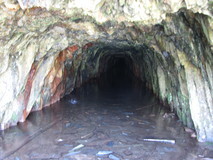 The path descended alongside a large spoil tip, and then went by a partly flooded tunnel from where an icy cold breeze was emerging. I then passed through lots of old ruined mining buildings, with occasional bits of rusting machinery here and there, and all slightly desolate and eerie. The route started climbing again, and somewhere along here I lightly grasped a fence to steady myself, and got an electric shock, which woke me up a bit! I was getting quite low on water, but just before reaching the col below Cnicht, there was a small stream, which looked like the last water source for a while, so I refilled my bottles. 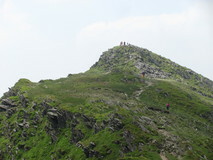 It was fairly easy going along the shoulder of Cnicht and I arrived at the summit at about half past twelve. It was surprisingly busy, quite a few families, and then a couple of teachers with a party of young kids appeared soon after I got there. 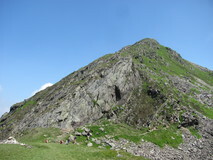 I didn't hang about for long, and descended past a steeper rocky bit to a lovely flat grassy area, which was a bit of a sun trap, and I had a sit down and put some more sun cream on. 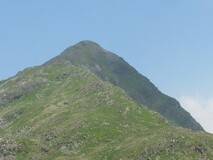 From the bottom of Cnicht it was easy going, along a pleasant stony track, through grassy and fern covered hillside, past little outcrops, and small trees, and I even heard a cuckoo. 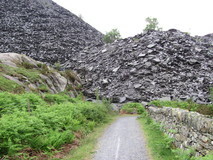 Near the end of the stony track, I noticed that the footpath signs had "Snowdonia Slate Trail" markers on them, which sounded intriguing. A very quiet minor road took me to Aberglaslyn, where I made use of a handily placed public loo in a car park. 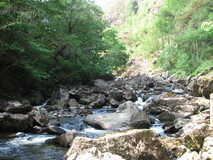 Then a superb stretch along the tree-lined river of Afon Glaslyn, lovely clear water, and a jumble of huge boulders in the river, with the path picking its way round rocks, and occasional narrow bits. Beddgelert was a bit of a shock to the system though, packed out with people, and I only stayed long enough to get a mango sorbet from the ice cream shop before pushing on. 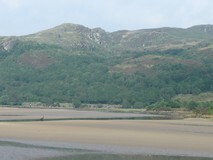 Easy going on narrow road and track led past Llyn Dinas, where a whole family wearing wetsuits were out for a swim. 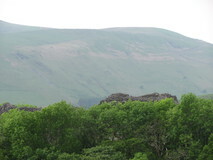 I reached the small campsite of Hafod-y-Llan at just after six, and quickly got pitched up and got some tea brewing. After three nights of wild camping, I really appreciated being able to have a shave and a hot shower. I got an early start, and was back on the route at about quarter to seven. 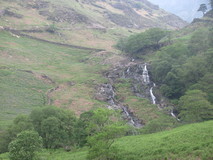 It started up the Watkin path, past some nice waterfalls, before striking out towards the col of Bwlch Cwm Llan, passing some huge bags of stones for path repair. The next section, up the shoulder of Allt Maenderyn, was excellent, some easy scrambly bits, and superb views over to cloud swirling round Y Lliwedd. 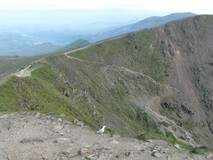 Looking ahead I could see lots of people milling round the summit of Snowdon, and the little train arriving. 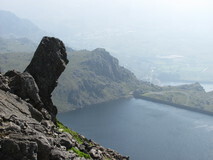 I reached the summit at quarter to ten, and didn't hang about for long, and pushed on down the very busy Pyg Track. 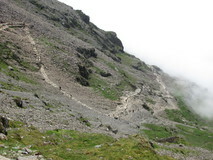 A little way down, the track dropped into cloud, which was actually quite pleasant as it was slightly cooler. Nearing Pen-y-pass the path crossed a wall that had twin side by side stiles to cope with the traffic! I was really looking forward to getting some lunch when I reached Pen-y-pass at midday, and was hugely disappointed to find that the cafe wasn't open. I headed over to the YHA across the road, which didn't have much of a selection, but at least I was able to get a pot of tea, and a couple of packets of crisps. I was very pleased to see that the YHA had a large board commemorating Tony Drake, creator of the Cambrian Way, very probably the UK's best long-distance walk. 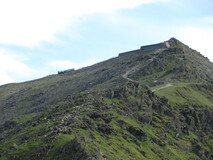 There had already been quite a substantial descent from the summit of Snowdon, but after leaving Pen-y-pass the route descended even further, with views of the road pass sweeping across the hillside in the distance. The descent was completely deserted, which made a strange contrast from the Pyg Track that I had been on just half an hour ago. 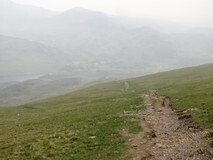 The path finally bottomed out at about 280m below Pen-y-pass, giving a total descent of 1000m since I left Snowdon summit. 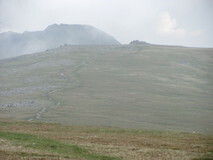 It then climbed up to reach the road coming down from Pen-y-pass, then crossed over and continued up the hillside to a shoulder, which led to Carnedd y Cribau, and then further on to Carnedd Moel Siabod. 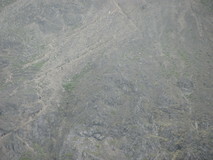 It was fairly easy walking, grassy slopes, and following a fence, which made for easy navigation. 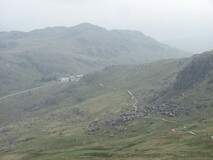 From the summit I could only just make out a very hazy Capel Curig below, and headed down on the rocky path. 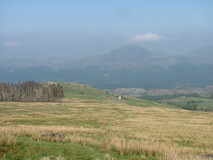 After some forest, I popped out at the back of Plas y Brenin, complete with dry ski slope, and then reached Capel Curig itself at seven o'clock. 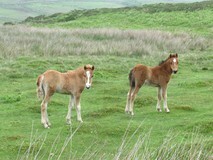 The campsite was just across the road, and good value at only four pounds. Nice to have hot showers again, two nights in a row. I had run out of noodles though, so adjourned to the nearby pub, where I got an excellent veggy shepherds pie, with a massive side salad, which felt really healthy after five days of snacking. There was no mobile signal in Capel Curig, but the pub had wifi so I was able to check the weather forecast, and it looked like there was rain coming in later on tomorrow. 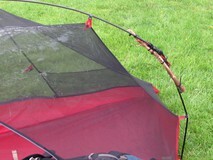 Only one problem with the campsite, lots of midges, and I could see them massing outside the mesh inner of the tent. I noticed that my little toenails were a bit sore, and looked a bit battered, so I did a bit of trimming before going to bed. 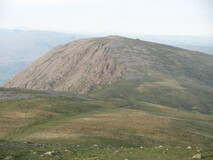 I was keen to make the last of the clear weather before the forecasted rain arrived, especially given that today's stage went through the top quality scenery of the Glyders, so I got an early start, and was back on the move at quarter past five. I walked up the road, and turned off past the small supermarket and Joe Brown outdoor shop. 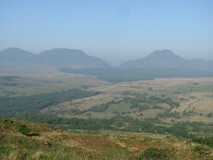 Even this early in the morning it was quite warm, despite a bit of mist, and I was soon down to T-shirt as I gradually climbed up to Y Foel Goch. 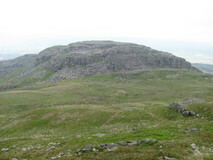 I reached the summit just before eight, and sat down and had some dried mango, cashew nuts, and the last of the oat biscuits from Trawsfynydd for breakfast. 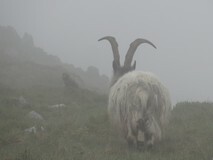 It was still quite misty, so I took a compass bearing and pushed on towards Glyder Fach. 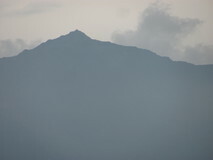 There were quite a few spiky pinnacles that appeared out of the mist that looked quite summit-like, and my altitude watch proved quite useful to check I had reached the real summit. 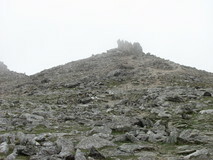 I took another bearing from the Glyder Fach summit, although I had to clamber over some huge blocks to get started. 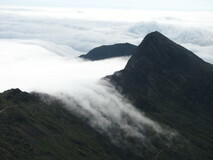 Shortly after the large spiky lump of Castell y Gwynt, the mist started to clear a bit, and I got superb views ahead across the rocky boulderfield to the shattered spiky pinnacles of Glyder Fawr. 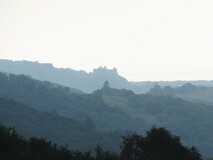 It was excellent scenery, slight other-worldy, and in places looking more like something from a film set. 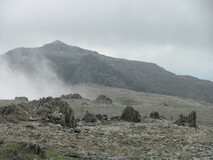 I reached Glyder Fawr just after ten, and pushed on down the steep rubble and loose rocks that led down to Llyn y Cwm. 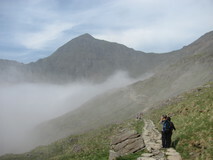 There were superb views across to the steep path that climbed Y Garn. I had not seen a single person so far since leaving Capel Curig, but on the descent a fell runner with a dog went past, and by the time I got down to Llyn y Cwm there were quite a few people milling about. 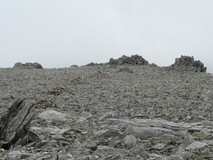 I pushed on past the summits of Y Garn and Mynydd Perfedd, to reach Carnedd y Filiast. From here the route descended cross country to the valley of Nant Ffrancon, and it was quite steep going, on a path at first, but later on wading through heather, which felt like it took ages, and I was quite relieved to reach the easy track at the bottom of the valley. 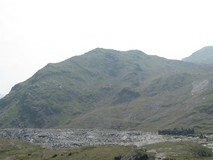 The track wound its way past a set of increasingly huge slate spoil tips towering above. Even though it was quite a warm day, every so often there would be a patch of cold air, which I suspected was coming from draughts emanating from the spoil tips. I reached Bethesda just before four o'clock. There wasn't quite as much there as I was expecting, but I took advantage of the public loo, and stocked up on some extra noodles, and a few snacks from a small convenience store, and drank a couple of bottles of sports drink. I got going again at half past four. 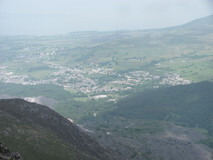 The route climbed out of town on small roads, with views back over the town and the huge Penrhyn slate works behind it. 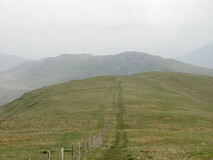 Fairly easy grassy paths led to Carnedd Gwenllian, which used to be called Carnedd Uchaf the last time I did it it, on the final day of the Cambrian Way. 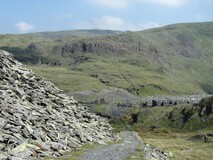 A well worn rocky path took me across to Foel Fras. I pushed on a little bit further until about eight o'clock, then found a sheltered spot to pitch up. Literally a couple of minutes after I decided to stop, it started raining, so an extra speedy pitching operation had me lying in my sleeping bag with some tea brewing, without even having to get my waterproofs out of the rucksac! It rained for a few hours, getting quite heavy later on, but then cleared up for the rest of the night. 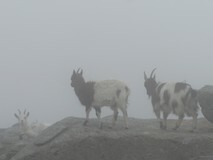 It was drizzling when I woke up, but by the time I had packed up and got moving at six, it had eased off. Fairly easy descent down to the Roman Road, past lots of wild horses, then a cross country section heading north over some slightly marshy ground. 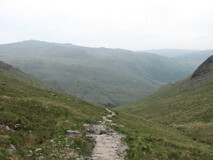 I lost the faint path within about a minute, but further on I picked it up again and managed to keep on it all the way until it met the North Wales Path. It was a little marshy in places, but nothing too bad. 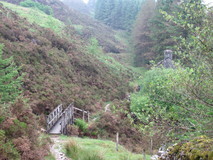 Once on the North Wales Path the route finding was very easy. 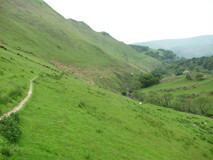 I crossed over Sychnant Pass and then shortly after, the very final descent to Conwy. 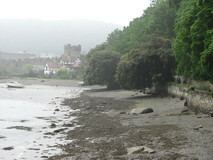 There was a nice last stretch alongside the river, with views of the castle ahead. 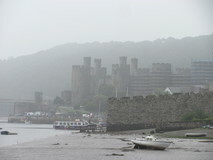 I arrived at Conwy waterfront at half past eleven. I sat on a wall and sorted myself out for the journey back. I put some fresh socks on, packed away my trekking poles, and undid my tent pole splint so I could pack the pole away, and left the stick behind for a lucky dog to find. The super lightweight approach didn't stretch to any spare clothes, so I nipped into a shop on the way up to the station and bought a clean top to wear for the journey home. 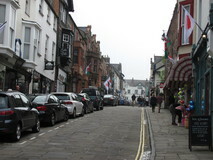 Beware of strange ticket problems getting back from Conwy if you are heading South! The station is too small to have any ticket machines, so you have to buy tickets on the train. However, the portable machines they use on the train can't do tickets through London, so they sell you a ticket to Chester, and tell you to go to the ticket office there and pay an excess to extend it to your final destination. But there is a catch-22, which is that the ticket office at Chester don't know how to do ticket extensions! Or not easily, it took about twenty five minutes, and at one point there were three staff puzzling over how to do it, whilst a queue of about fifteen people built up behind me. So I missed my connection whilst all this was going on, but on the plus side it did give me some extra time, waiting for the next connection, to sponge off in the loos, and put my new clean top on, and get a celebratory cup of tea. 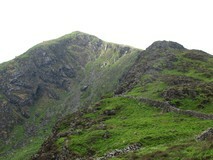 All in all I was very pleased with the route, it took in an excellent mix of scenery, and some good summits. 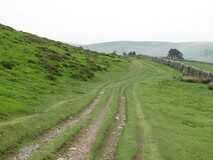 It reminded me of the Northern section of the Cambrian Way, and in fact some stretches overlap quite a bit with the Cambrian Way route. 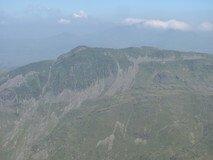 Particular highlights were Cadair Idris, the stretch along the craggy plateau leading to Moel Ysgyfarnogod, the circuit round Moelwyn Mawr and Cnicht, and the superb rocky landscape of the Glyders. I was really lucky with the weather, I had very little rain, and quite a bit of sunshine, plus the marshy bits seemed a bit drier than they would normally be. Not sure I ever fully got the hang of the many "faint paths" described in the book, but heading in vaguely the right direction normally worked out OK. 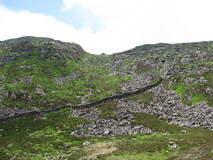 There were a few cross country sections without any path at all that were heavy going, particularly the section descending from Y Garn (after Dolgellau), which needs extreme care. Note that the route is not waymarked, so you need to be able to navigate OK with maps and compass. I supplemented the 1:50k maps in the book with the three OS Explorer (1:25k) maps, because I find the extra detail makes them easier to navigate from. As it happened, I already had the maps, with the Cambrian Way marked in highlighter, and already cut into pieces to save weight. 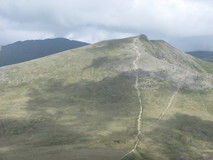 I marked out the Snowdonia Way with a different colour to avoid accidentally veering off on to the wrong walk! For the first few days I managed fine with just the instructions in the guidebook, apart from taking the odd compass bearing to make sure I was descending off summits in the right direction. However, I was lucky to have very good visibility, and I did need to do more navigation later on when the visibility wasn't so good. 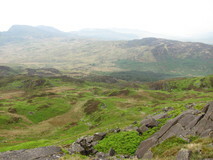 Whilst on route, I spotted a few signs for a new 133km (83 mile) walk called the Snowdonia Slate Trail, which also sounds interesting, so I may well be back to give it a go!